A SpaceX-built Dragon spacecraft is scheduled to leave the International Space Station on Sept. 17 to bring approximately 3,800 pounds of cargo back to Earth. NASA said Monday the cargo will include science samples from human, animal, biology, biotechnology and physical science studies as well as education activities. SpaceX launched Dragon from the Kennedy Space Center in Florida on Aug. 14 and delivered 6,400 pounds of crew supplies and experiments to ISS as part of the company’s 12th Commercial Resupply Services mission. 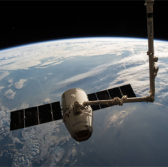 Flight controllers will release Dragon from the space station using the station’s Canadarm2 robotic arm then command the spacecraft’s deorbit burn before it splashes down in the Pacific Ocean. NASA and the Center for the Advancement of Science in Space aim to retrieve, process and distribute the science samples within two days after splashdown. The agency expects Dragon departure and splashdown to occur Sept. 20 if adverse weather conditions in the Pacific prevent the spacecraft’s scheduled return.